Clasp/Buckle: Stainless steel Rolex deployant clasp stamped "S 12" and "78390"
When released in 1987, reference 16520 marked the first foray of Rolex into the realm of automatic chronograph wristwatches. The success of the model was overwhelming, and it helped spark the interest of the collecting community even for its manual ancestors. 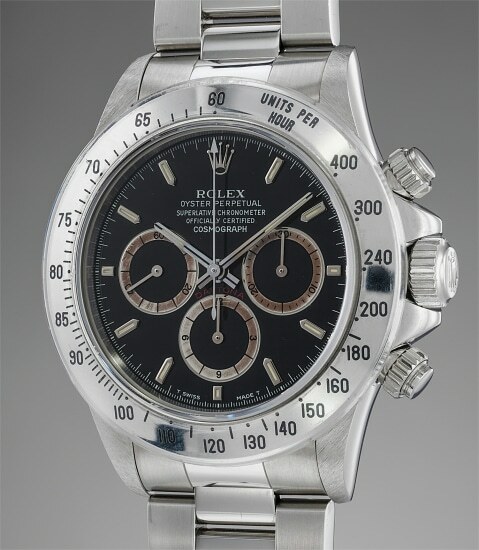 Today, a serious Rolex collection can not be considered complete without an example of the “Zenith” Daytona (so called because the automatic calibre was supplied by Zenith and then modified and finished by Rolex), and the model is constantly increasing in popularity. Over time, scholarship on the reference has expanded, and some iterations - such as the “Floating” ones, or the porcelain dials, or the “Four Liners” - have come to be recognized as supremely collectible timepieces. The most visually striking among these “next level” Zenith Daytonas is arguably the “tropical” variation, perfectly exemplified by the present timepiece. The result of defective batches of paint delivered to Rolex in the mid-1990s, these timepieces sport white chapter rings which over time turned brown. The process - and its result - is influenced by a multitude of factors, such as the batch of paint, the exposure of the dial to light, and so on. Thus, the final result is unique for each piece, with sometimes, such as in this instance, striking surprises. The chapter ring of this specimen in fact tropicalized unevenly and today they feature an incredible “tie-dye” effect to the tropicalization. Such an unusual and attractive dial, combined with the presence of the original box and Guarantee of the watch and its overall superb state of conservation, renders the present timepiece one of the most collectible and fascinating examples of tropical 16520 to ever grace an auction room.